Friday January 2nd. I felt rotten today. It's my mother's fault for singing 'My Way' at two o'clock in the morning at the top of the stairs. Just my luck to have a mother like her. There is a chance my parents could be alcoholics. Next year I could be in a children's home. I really liked this book because it explains it's not your fault if your parents are separating. My favourite character was Mum because tried was really kind to Adrian even when she was with Mr Lucas.I recommend this book to kids who have a hard time in school, with parents or anything else. I found this one a little too old for me and not as funny as I had anticipated. A book that is suitable for older readers. SO FUNNY!!! I enjoyed the book but found some of the language and information too mature for a 10 year old. I really like stories written in the form of a diary. Adrien is a 13-year-old "intellectual" with some issues at home, and this painfully relatable story pans out over a year of his life. I will definitely re-read this, but I wouldn't recommend it to anyone still in primary school. Loved all of the rude humour. 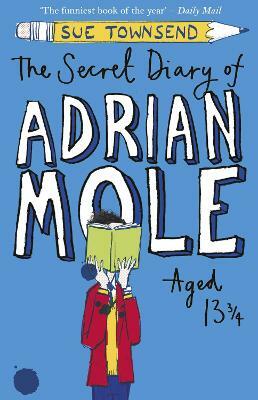 Adrian mole I would recommend this book to over tens. The life of a misunderstood intellectual who tries to survive with all the troubles in family, school, on the streets, his bedroom and his face.